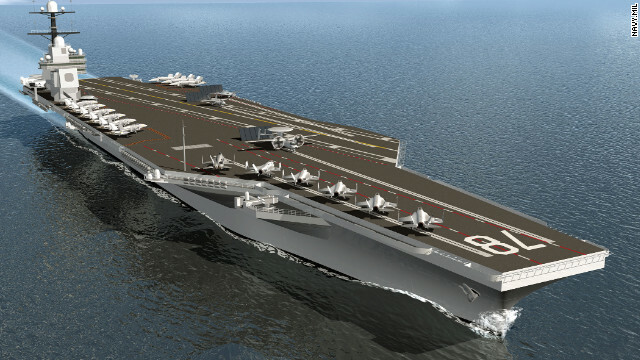 This is a Navy illustration of the Gerald R. Ford aircraft carrier, the first of the Ford class of carriers. [Updated at 6:17 p.m. ET] The U.S. Navy's new class of carriers will be the first to go without urinals, a decision made in part to give the service flexibility in accommodating female sailors, the Navy says. The change heralded by the Gerald R. Ford class of carriers - starting with the namesake carrier due in late 2015 - is one of a number of new features meant to improve sailors' quality of life and reduce maintenance costs, Capt. Chris Meyer said Wednesday. Omitting urinals lets the Navy easily switch the designation of any restroom - or head, in naval parlance - from male to female, or vice versa, helping the ship adapt to changing crew compositions over time, Meyer said. The Navy could designate a urinal-fitted area to women, of course, but the urinals would be a waste of space. Making the areas more gender-neutral is a relatively new consideration for the service, with most of its current carriers commissioned before it began deploying women on combat ships in 1994. But it wasn't the only reason for the move. Urinal drain pipes clog more than toilets and therefore can be smellier and costlier to maintain, Meyer said. "There's a lot more at play in the design objectives than (making the toilet areas) gender-neutral. We're saving money in maintenance costs, and we’re improving quality of life," said Meyer, manager of the Future Aircraft Carriers Program for the Naval Sea Systems Command. - Sleeping areas, or berthings, generally will be smaller, designed for fewer people per room. On current carriers, some berthings have more than 100 sailors each. On the Ford carriers, the number will be closer to 30 to 50 each. - Heads will be attached to berthing compartments. Currently, many sailors have to traverse a passageway between a berthing and a head, meaning sailors who’ve just woken up have to dress up more for a trip to the head than they would if it were adjacent. The new Ford-class features were first reported by the Navy Times. Some sailors said that they're happy to lose the urinals because they're hard to clean and maintain, the Navy Times reported this week. The Ford class is the future replacement for the Nimitz class. The Ford carriers are designed to allow more aircraft sorties, but with about 660 fewer crew members, according to the Navy. The first three Ford carriers are scheduled to debut between 2015 and 2027, at a total projected cost of $37 billion. That cost includes non-recurring engineering expenses and research and development costs for the first carrier, the Navy says. U.S. Navy: 'Hollow' force or 'the best in the world'? extra money no. They are classified as eiehtr with or without dependents no matter how many and he already has dependents. They also have eye coverage. and mental health coverage. Do men use loiton? I'd bet if you put loiton in their bathroom at home it would go equally unused. I think you are battling a bigger issue than men using loiton in a public bathroom. I think you are trying to get men to use loiton period. That's the root cause of your loiton delima. I personally have never seen a man putting loiton on his hands. Maybe if you provided men with . Well, I don't know what. But something men actually use. TATAFASA Tolonjanahary Edith Posted on Dear Admin,Could you please poidrve me with admission requirements and application procedure. I have a Bsc degree in Applied pharmacology from one Malagasy university and currently I am looking for free scholarship(masters) in the field of Applied pharmacology.thank you. Political correctness like this will be the death of the United States. Stop these idiots while we still can! You haven't lived until you have had to maintain a shipboard metal urinal to military "spit and polish" standards.